Have you wondered what it takes to build a beautiful, classy website like a pro? If you have, don’t worry. We’ve done it for you. It took us thousands of hours in research & development. Our entire team has been fully focused on building a great website building tool. Finally, we’ve come up with “WP Page Builder”, the most advanced page building tool ever developed for WordPress. Let’s take a glimpse at the core offerings of WP Page Builder. Before going into the details, let’s have a quick overview of WP Page Builder in the video below. Only watching a video of a few minutes will be like scratching the surface. Let’s dig deep to know the true power of this advanced WordPress page building tool. What makes WP Page Builder a great tool? From creating sites with real-time frontend editing to offering plenty of built-in pre-designed layouts and blocks, there are tonnes of features and functionalities in WP Page Builder. Let’s check some of the most important ones below. What will amaze you the most about WP Page Builder is, it is FREE. You can use this WordPress page builder for your website at no cost. Features like ready blocks, predesigned templates, library system, and device-wise responsive control don’t usually come at free. Here in WP Page Builder, you can utilize all of these groundbreaking features with plenty of other functionalities. Build web pages much faster than ever before. Add numerous design and function-elements. Enjoy the smoother ever site development experience. With WP Page Builder, you can build web pages without needing to write a single line of code. Any functionality or design you think of, can be brought to your website with this rich web page builder. 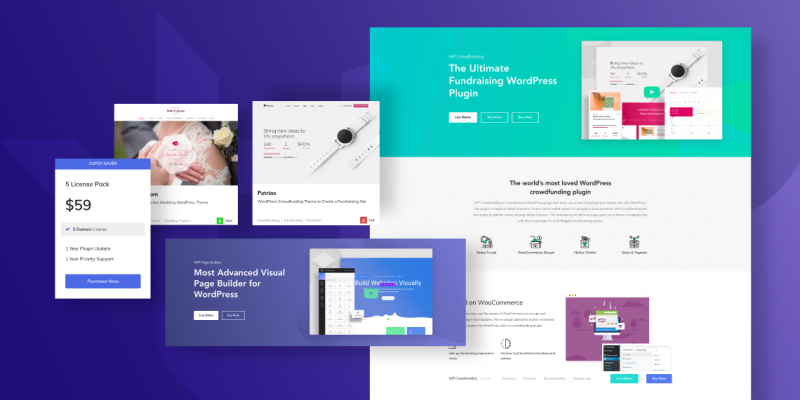 The drag & drop system of this wonderful WordPress page builder relieves you from writing codes and helps bring out beautiful designs in a snap. The plugin offers a smart drag & drop site building mechanism. Anything (text, button, icon or others) you want to add to your site, just drag that particular addon and drop where you want to have it. The dropped element on the site offers edit, duplicate, delete and other customization options while hovering over them. In a nutshell, the editor panel gets you including but not limited to the following. Drag and drop the site elements. Yes, exactly just do it and you’re all set. Bring changes to every styling option including an element’s text, size, color, margin, padding, alignment depending on the type of addon you are using. Utilize real-time frontend editing system and see the changes happening right before your eyes. Capitalize the unlimited undo and redo options for any action you take. You can revert to the previous state of the modification and to the recently discarded one by just clicking on the undo and redo button. Have no chance of deleting elements mistakenly as it alerts you every time you click on the delete option. Already surprised to see the features and functionalities of WP Page Builder? Hold on a second! we are going to give you another reason to be thrilled again. WP Page Builder has rich libraries of ready page layouts and design blocks for you. There are plenty of predesigned layout templates in the WP Page Builder plugin. You can use these readymade page layouts to launch your site quickly. So you are relieved of creating your site from the scratch. Simply choose a layout and your page is just a click away from being created! Use WP Page Builder’s ready-to-use design blocks. These built-in blocks will make your development work superbly easy. Drag & drop the blocks on any page you want. The page will get the design instantly. The whole process completes in a blink of an eye! With WP Page Builder’s library system, you can reuse a previously designed block repeatedly on different pages of the site. To utilize this feature, you need to save your design blocks in the library once, and then you can place/reuse them as many times as you wish. People from different parts of the world will visit your site, but they all will not come from the same type of devices. So, responsiveness is one of the most important factors to have in mind while developing a site. WP Page Builder is ready to take this challenge. WP Page Builder creates 100% responsive layouts. Moreover, using its device-specific responsiveness controls, you can adjust the element sizes and behaviors dedicatedly for specific devices like computers, tablets, and mobile phones. You can also show or hide a particular element on specific devices using this device-wise responsive system. 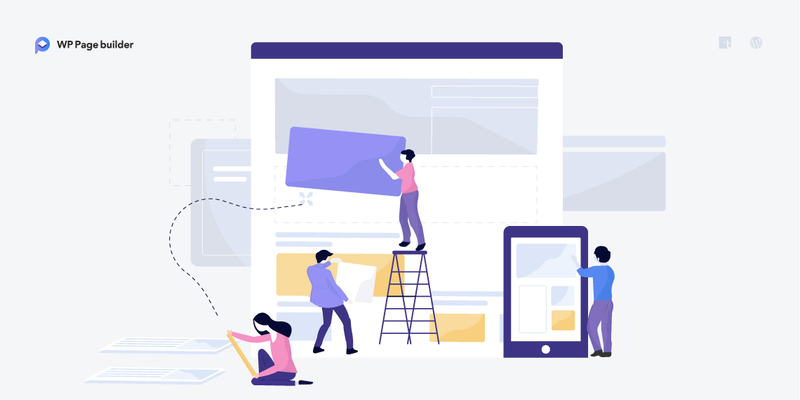 Creating beautiful and functional web pages requires different site elements like text, title, contact area, feature box, pricing table, image, icon, button, and many more. To embellish your site with many of such things, we have 28 addons in WP Page Builder. You can use these addons on your web pages and modify the look and feel your way. Here are some of the important addons with their purposes. Feature Box: To display the features of your products on the website, you can use the Feature Box addon to present features with icons, headings and texts. Accordion: If you need any collapsible text content on your site, use the Accordion addon and tweak the style your way. Carousel: Besides showcasing profiles and testimonials individually, you can also have them in the carousels too. Use Person Carousel and Testimonial Carousel addons for that. Pricing Table: For different services you offer or products you sell, you need pricing table(s). Our Pricing Table addon in WP Page Builder lets you set up pricing tables easily. Contact Form 7: This addon lets you have a contact form anywhere on your web pages. Just drag the addon then drop it where you want the form to be. Button & Button group: Not only a single button, you can also have a whole group of them. Use Button addon for a single button and Button group for multiple buttons. Icons play a significant role on website design. They are not just about design but also you need them to highlight or differentiate contents. Having that in mind, we provide a rich collection of font icons with this WordPress page composer tool. Font Awesome: There are 670+ Font Awesome icons inside WP Page Builder. Use them anywhere on any content of the web pages. Dedicated WPPB icons: Apart from Font Awesome icons, you can also utilize 340+ WPPB line icons on your site. Besides offering exclusive site building elements, WP Page Builder supports all WordPress widgets. So, use the page builder’s goodies while having all default features intact. Alongside having 28 addons inside to make site building easier, WP Page Builder is extendable with your own addons. If you are a developer and want to use your own addons for extra functionality or design, you can surely do that. Developing such a versatile WordPress page builder is never possible with a one-time effort. 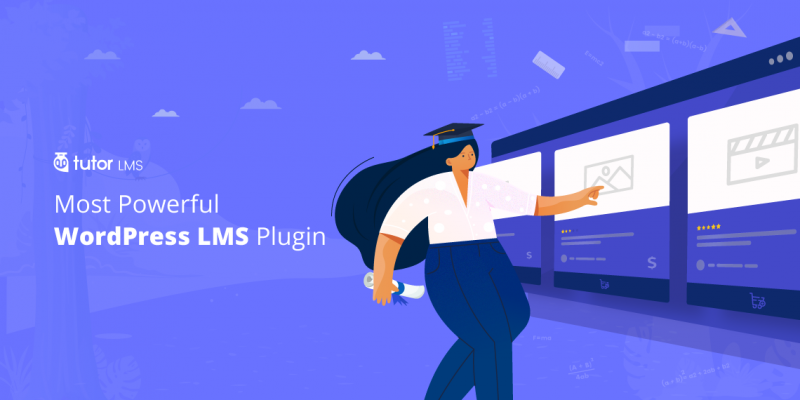 Even after spending thousands of hours in research and development, we will continue adding new stuff to WP Page Builder to make it even greater. Regular updates will also be issued. Stay with us and let us know what you feel about our WP Page Builder plugin. Today we’re releasing the Beta version of WP Page Builder. We hope you will enjoy this version. Now let’s look at the development timeline for the plugin. Note: This Beta version is not recommended to be used on production sites. Follow us on Facebook, Twitter, and YouTube to get our news, updates, contents, and offers in your feed. Q how can I create #table ? Hi loving your page builder, Im new to making websites, and need a page builder where i can make a website for unlimited customers and hope it’s the one and only page builder i need. What is the future in reselling templates, and how does it work – Do you have a light version Free, and a Pro version for people like me who wana make template and sell them ??? Hi, first of all thank you. Right now only free version is available. And, I hope you can do everything using the free version. Hi linkbuildingpakke, you can build themes using the tool, and sell these themes to your clients. Thanks. And the “Stable: 16 August 2018” What extra at date date ? It will be really nice if we can see a demo of all the 28+ addons, like in SP Page Builder https://try.sppagebuilder.com/index.php/addons. So that we know how exactly the addons display/function. I hope this WP Page Builder will not have any issue with Genesis Framework.